One of our family’s favorite Christmas traditions is a Christmas countdown calendar. We have several of these days till Christmas countdown calendars and they’re a hit year after year. 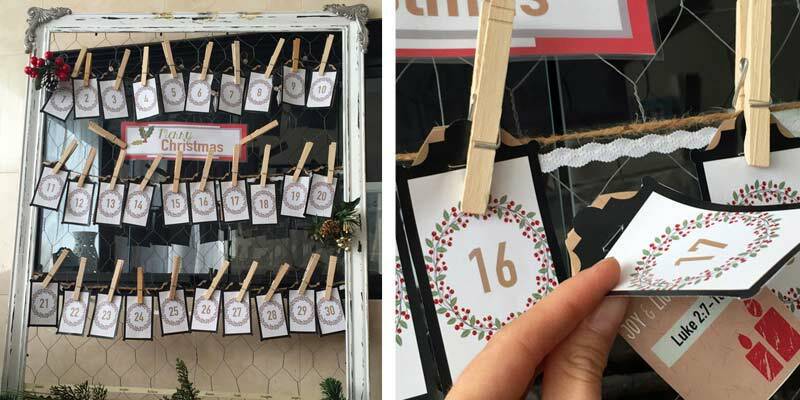 A few years ago I got the idea of combining a Christmas countdown calendar for kids with a Christmas Bible study that told the Christmas story! Our kids loved the idea of learning about the biblical Christmas story a little at a time, and now it’s become an essential Christ Centered Christmas family tradition during the 30 days before Christmas. I want to show you how you can make this easy 30 day Christmas countdown calendar that will not only be a fun Christmas activity for your kids but will be an easy way to create a Christ-centered Christmas in your home and easily do Christmas Bible study lessons as a family. If you’re looking for an easy fun way to keep the focus on Christ during the hectic holiday season, you’ll simple Christmas activity love this that teaches kids about the true Christmas story, and grows everyone closer to God through the process. How Does The 30 Christmas Countdown Bible Study Work? 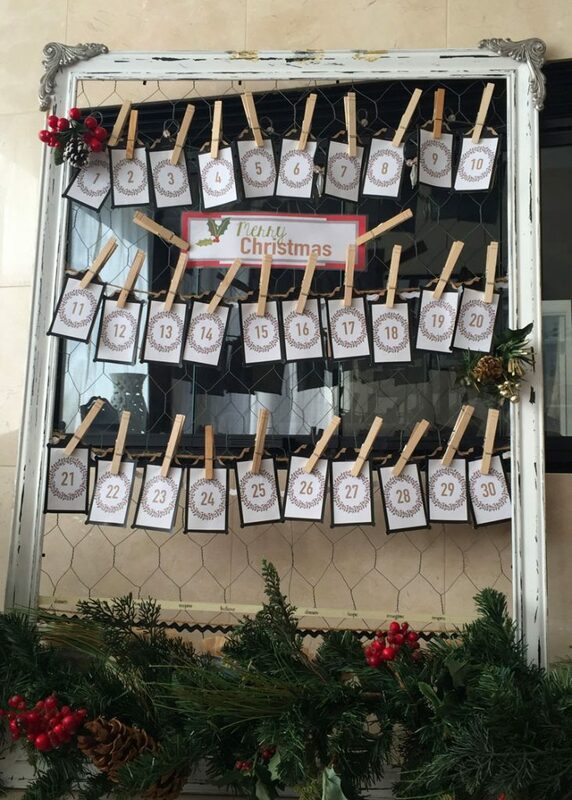 The idea is simple: Read a little bit of the Christmas story each day using a fun Christmas countdown calendar. Each day of the calendar contains a Bible passage to read and study together, so as family members enjoy their days till Christmas countdown they’re also getting a mini Bible study each day. Kids love it because they get to choose something fun everyday from the calendar; and parents love it because it’s a fantastic way to keep God as the center of the Christmas traditions. But I can hear you asking: Where do you start? How do you even put something like this together? The good news is that it’s all done for you as part of the Christ-Centered Christmas Family Traditions Printables. You simply print the tags and hang them up with clothespins (on a ribbon, for example). Each day as you countdown to Christmas remove that days’ tag and read the Bible verses together. The Christ-Centered Christmas Family Traditions Printables also includes a sheet where kids can respond to the day’s verses using the 5Rs Bible Study Method ™, or even just drawing a picture and/or writing a sentence or two. Again, the Christmas Countdown Bible Study shown here is from this resource—a fabulous collection of 143 printable resources that make it easy for you and your family to enjoy wonderful, Christ-centered Christmas celebrations like this! Plug and Play. This Christmas Countdown method makes the Bible lessons so easy! The verses are already chosen and the daily cards are already designed. You just print, cut the tags and go! Great Fun for Kids. Kids can take turns grabbing each day’s tag and reading the verse. It’s a wonderful family tradition that makes Christmas Bible lessons especially fun and exciting for kids! Learning a Little at a Time. I love that this method allows you to hear the Christmas story one bite at a time, even digging into the messianic prophecies and other scriptures that give us a true picture of the miraculous nature of this event! Totally Customizable. By default the Christmas Countdown Calendar Bible study is 30 days long, but you can also adapt it to your family’s needs. Perhaps you only do the countdown 3 days a week; or maybe you choose a few to read on Sunday afternoons during Advent. Since the system also contains a list of the entire Bible countdown all in one place, it’s flexible enough for your family’s unique situation. Engage and Go Deeper. After you’ve read the verse, the system contains several Bible response tools that encourage your family to really consider and apply what they’ve learned that day. Christ-centered, customizable home decor (that your family can make together! ), including banner pieces, and 8 x 10 and 5 x 5 full-color art! It includes everything you need to finally discover the Christ-Centered Christmas you and your family long for! I know that you’ll love doing this 30 Day Countdown to Christmas Bible Study with your family… along with the other parts in this incredible system! Be sure to pick up your copy so you can make this 30 Day Christmas Countdown Bible Study as fast and easy as possible!